Do you want to advertise deals that you have going on in your business on a daily basis or get some other message out to your potential customers? 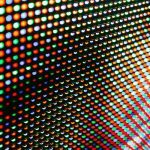 You could hang a paper sign on your front door and hope they see it – or you could install LED business signs outside of your store and guarantee that they get the message you send out loud and clear. Greenfield Signs & Lighting can help you install outdoor LED signs that will get the attention of those who drive and walk by your store. We can also show you how custom neon signs, lighted business signs, and outdoor LED signs can improve your business dramatically and get more people to visit your store in the Indianapolis and Greenfield areas of Indiana. 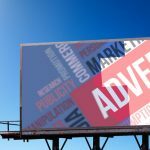 There are so many businesses competing to attract the attention of prospective customers these days that it can be difficult to stand out with a regular sign outside of your store. 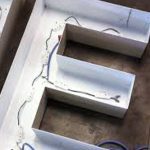 But with lighted business signs, custom neon signs, and LED signs, you can gain an advantage over other shops and stores that are using standard signs on their exterior. With the full range of different types of signs available from Greenfield Signs & Lighting, we can help you advertise deals and spread the word about your business. Those who drive or walk by will see your signs, read them, and know whatever it is you want them to know in a matter of just seconds. 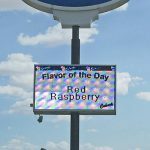 Whether you use your sign to push your company logo or you offer a new message every morning with a deal of the day, you will find that your lighted signs and LED business signs will do wonders for your business. 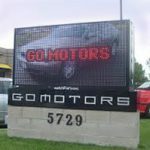 In addition to providing LED signs for businesses in Indianapolis and Greenfield, Greenfield Signs & Lighting also specializes in creating digital billboards, full color displays, monochrome displays, message center signs and more. If your goal is to get a message out into the world about your business, you will appreciate the work that we do and quickly learn why so many other businesses have trusted us with creating their signs. From conception to creation to delivery, we are a family owned and operated business that can handle it all for you. Get the word out about your business with the help of a new LED business sign from Greenfield Signs & Lighting. 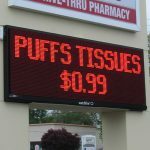 Call us today at 866-740-9797 and learn more about how outdoor LED signs and other lighted business signs can benefit you and your bottom line.